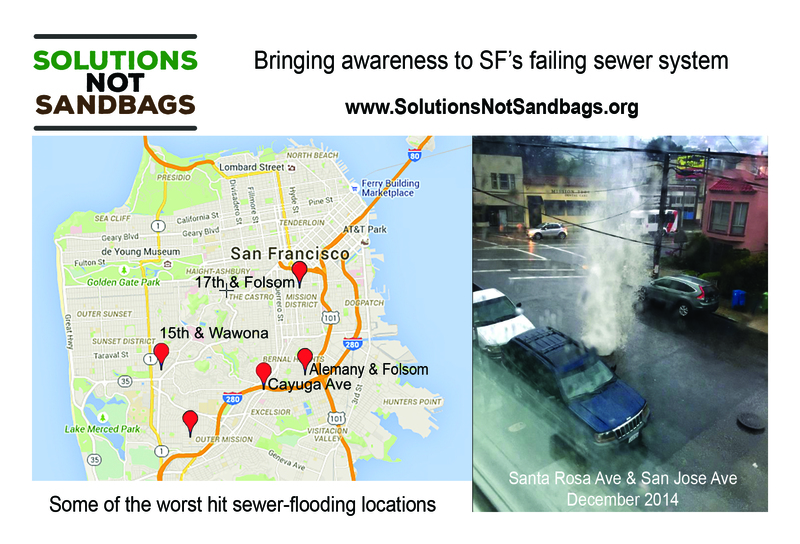 Solutions Not Sandbags is created to raise awareness about the citywide San Francisco sewer failures. This INFRASTRUCTURE / DEVELOPMENT issue spans over FIVE DECADES affecting at least FOUR districts. 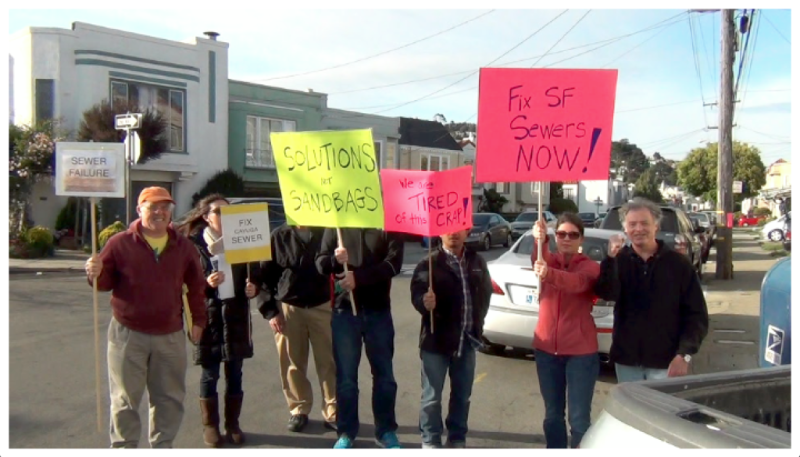 District 7, District 8, District 9, and District 11 continue to be inundated with raw sewage and rainwater flooding due to infrastructure inefficiencies and development approvals throughout SF. The City’s century-old sewer system is not up to standards. Many of SF’s sewer system still use old clay pipes, a flood-prone combination that threatens countless homes. Complaints were made to the City in the 1960s to no avail. Although a Sewer Bond measure, Proposition B, passed in 1964, the sewers in working-class neighborhoods have instead been neglected in favor of catering affluent neighborhoods. Earmarked funds in public SFPUC records clearly show reallocation to projects upstream! 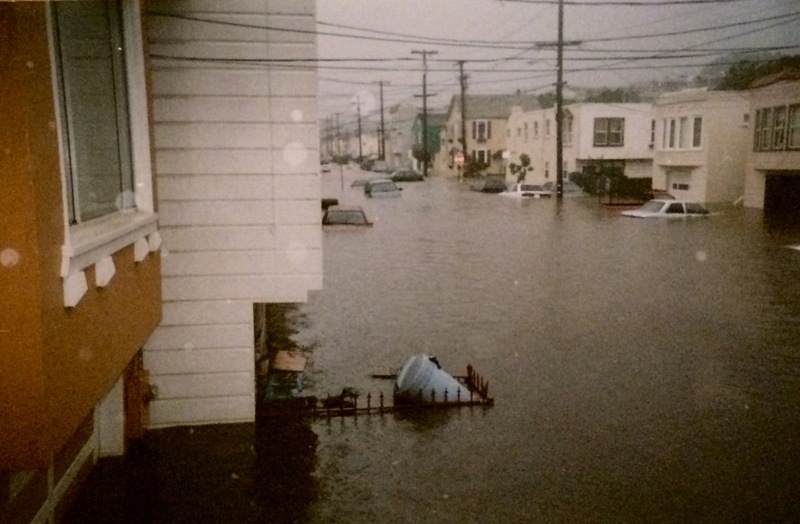 Nearly half a dozen major floods between 2004-present, with no solutions proposed by the City, have left residents feeling forgotten and under-represented for project funding. What We Face: DOES THE CITY CARE ABOUT US? Homes have been contaminated with raw sewage, leaving many without working furnaces and heat during key winter months. Elderly and children especially hit hard. Water has damaged foundations, homes suffered major property loss, and diminution of value due to repeated sewer failure flooding. 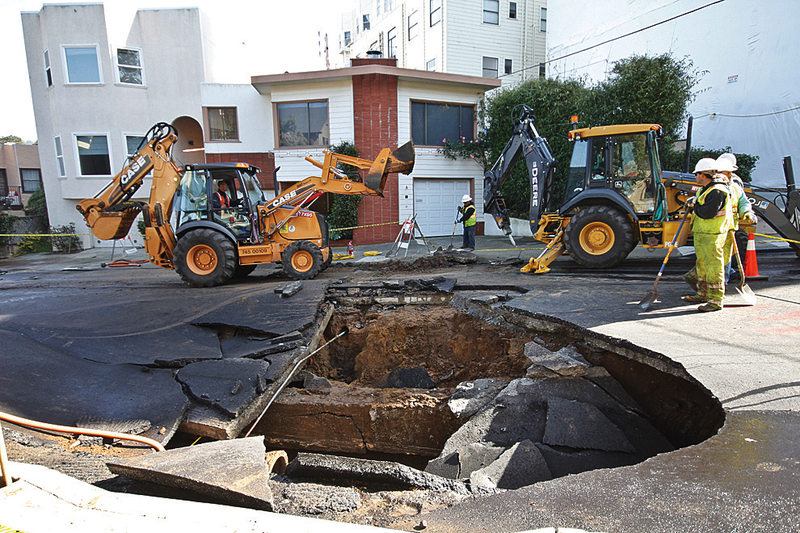 To date, the City of San Francisco, despite verbal assurances in December 2014 that the city would fix problems, has instead denied nearly all claims filed by affected property owners. PG&E reinforces gas pipes with steel. Is this to prevent another 2010 San Bruno pipeline explosion because adjacent sewer pipes are unreliable? 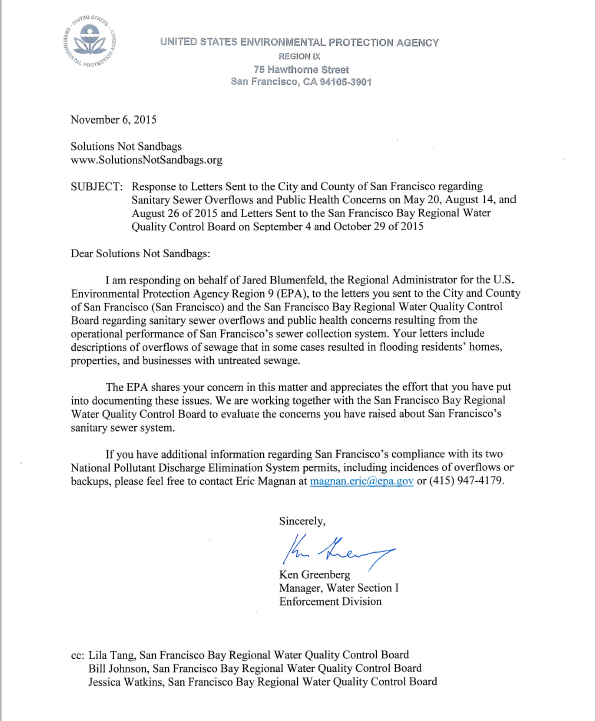 Where is the San Francisco Public Utilities Commission? What We Need: MORE ACTION LESS TALK! 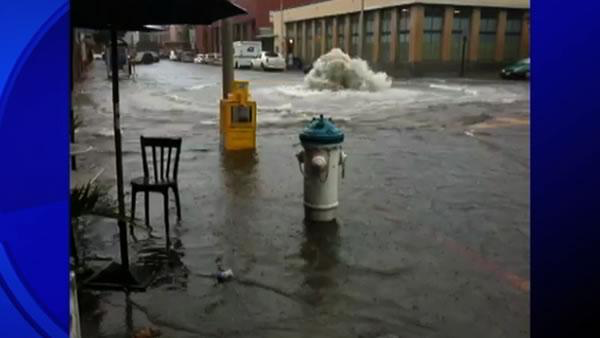 The City of San Francisco to commit money and resources to fix the sewer problem in our neighborhoods once and for all. We need solutions NOW. 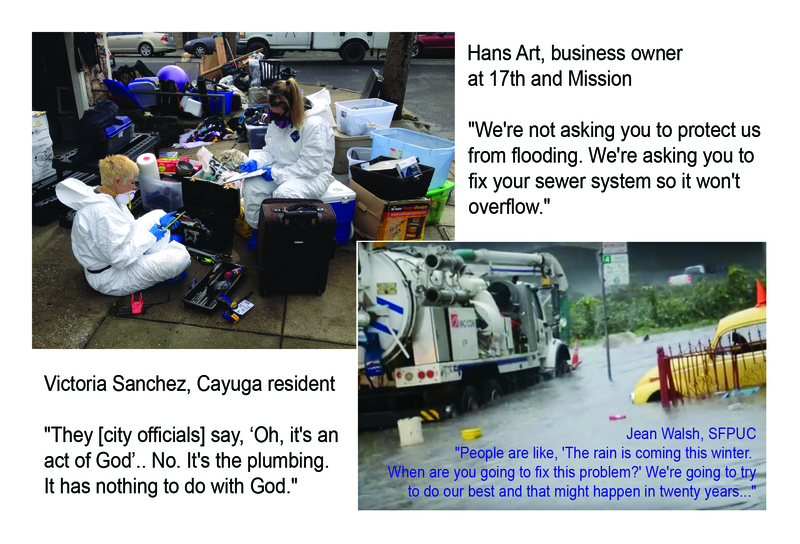 Urgency to fixing the aging sewer in (1) Cayuga at Glen Park-Mission Terrace (2) 17th & Folsom (3) 15th & Wawona. We understand planning takes time, but a decade is long enough. Better maintenance and clearing of blocked sewers in our area. At minimum, we need monthly checks and reporting to the neighborhood of all upkeep and repairs. The City of San Francisco to review the claims process and honor the commitments made in December 2014. We need the City of San Francisco to stop turning away from this issue and treat it like the crisis it is. Timeline of meetings with SFPUC and City officials with proposed solutions. It has taken SFPUC and City officials five months to meet with residents. Regurgitated known information with an underplaying of this issue’s severity has left many frustrated. Urgency around upgrading the City’s 100-year-old aging sewer system. Watershed Project ideas pertaining to detention tanks do not mention the area in or around Cayuga & Rousseau. Ground zero of the Cayuga corridor flooding. Better maintenance and clearing of blocked sewers. Residents are taking initiative to clear sewer grates. At minimum, we need monthly checks and reporting to the neighborhood of all upkeep and repairs. Review the claims process and honor the commitments made in December 2014 by Mayor Ed Lee, Supervisor Scott Wiener, Harlan Kelly, and the San Francisco Public Utilities Commission. Despite verbal assurances that the City would fix problems, to date, it has denied nearly all claims filed by affected property owners. Many, especially the elderly and children, have been left cold without working furnaces and heat.